Early Bird has been extended until this Friday 18th January due to most only returning from holidays this week. $130pp – Adult, $65pp Junior otherwise $150pp Adult / $75pp Junior if paid after the 15th. Payment can be made by cash, cheque or online. Vicki will be at Cardo’s on Friday night for anyone wanting to sign up then. Account Name: DGSFC, Bank: Westpac, Branch: Port Denarau (BSB 039019) – please use your name as reference. Registration will be held Friday 25th at Cardos. Weigh-ins will be held at the Cardos Saturday and Sunday with food and drinks each night. Prizes on offer for Heaviest Tuna ($5000), Top Male, Top Female, Top Junior, Heaviest other species. Top Big Boat, Top Small Boat and $500 Last Man standing. Please remember each boat must have an operational radio which must be used throughout the tournament – as per the rules. Any queries please do not hesitate in contacting us. 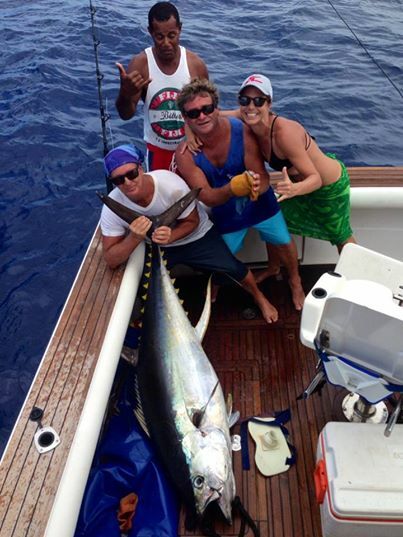 79kg Yellow Fin Tuna Caught by Geoff Doig on 15kg line in 2014 Competition "New Fiji Record"